Experience 80%-90% TE (Transfer Efficiency) and a cleaner work environment with Apollo Sprayers Turbospray HVLP spray systems, the easiest to use HVLP spray finishing systems available. Apollo’s gentle warm dry turbo air ensures no moisture contamination in your finish or your work. If your desire is to increase the range of coatings and finishes you want to spray with ease and without compromise, consider Apollo’s enhanced Power-4 HVLP Turbosprayer. With 12% more power than other systems in its class, you’ve got the power and performance to spray higher viscosity materials with excellent results. With a powerful motor installed, spray everything from stain to multi-spec paints at manufacturers recommended viscosities. 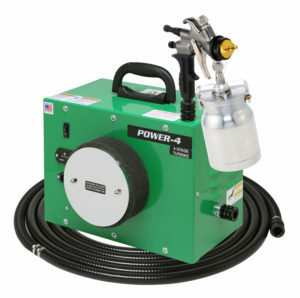 The Power-4 is used by woodworkers, boat builders and restorers, automotive and airplane restorers as well as any industry desiring super fine atomization to spray stains, lacquers, enamels, polyurethanes, catalyzed finishes, conversion varnishes, and linear polyurethanes, as well as any waterborne coatings, latex (emulsion) paint multi-spec paints and more. 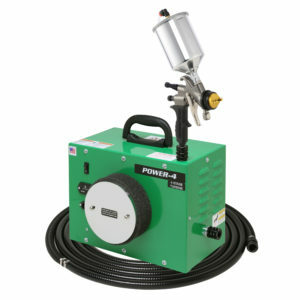 The Power-4 will support multiple spray guns with an optional Y-connector, part #A4227. The Power-4 is available with the All-NEW AtomiZer® 7700 non-bleed spray gun in 1 Quart Bottom Cup, 4 models of Gravity Cup (90cc/250cc/600cc/1000cc) and an 8oz Mini-Cup. Our Handi-Hold® Spray Gun Docking Station, an Apollo innovation, will store, hold or transport your spray gun in a vertical position with no risk of knocking or falling over. It’s ready to spray when you are.